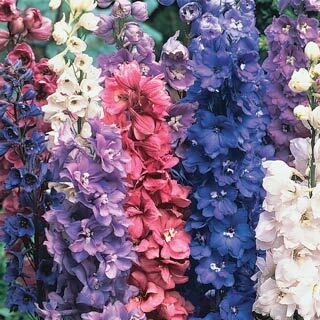 Delphinium plants feature tall stalks covered with blooms. If rabbits tend to munch on your garden plants, these are a great choice: rabbits typically avoid them. Most Popular Colors: Blue, pink, purple, white. Soil Preferences: Choose rich soil with a leveled pH. Too much acidity will stunt the plants, but lime can be added to correct acid soil. Climate Preferences: Delphiniums will blossom in any temperate climate. Sun Exposure: Partial shade to full sun. Landscaping Tips: Because delphinium typically grow taller rather than wider, use them as border plants or at the back of your flower beds. Planting: Choose rich soil with a leveled pH. Too much acidity will stunt the plants, but lime can be added to correct acid soil. Space delphiniums 1 1/2 to 2 feet apart, and set the crown at or just above the soil level - the stems will rot if buried too deep. • Tall varieties may require staking to keep stalks from snapping. • Water well as the plants become established. • Cut back flower stems after the first bloom of the year to encourage later blooming. • Stalks can be cut down after the first frost of the year: aim to snip them to an inch or two above the ground. • These perennials also tend to be short lived. It may be necessary every 3-4 years to plant additional plants, or propagate from basal cuttings.